UPDATE:Obama addressed gun violence in Chicago and across the nation in his speech. Click here to read more on what he said. 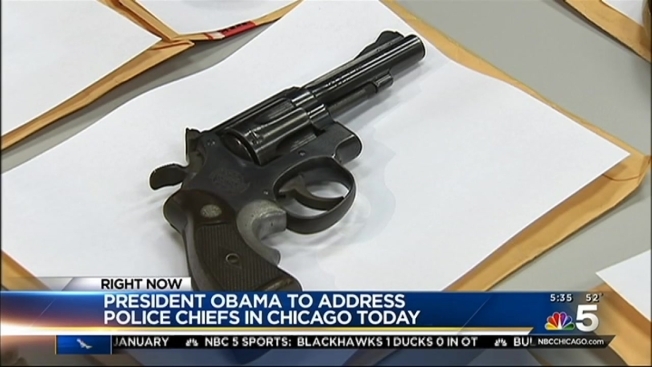 President Barack Obama traveled to Chicago Tuesday to address a group of police chiefs from across the world about gun control and criminal justice issues. Obama arrived at O'Hare International Airport on Air Force One around 1 p.m. CT and is scheduled to deliver his remarks at the conference at 2:15 p.m. CT. 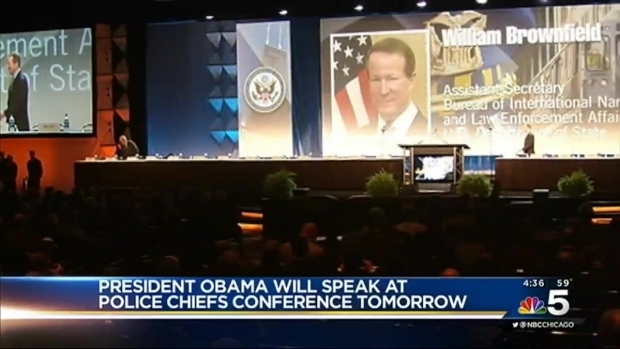 The five-day event at McCormick Place is an annual conference hosted by the International Association of Chiefs of Police. It's the world's largest law enforcement conference, with more than 14,000 professionals in attendance. The goal is to teach law enforcement officials new policing techniques and introduce the latest equipment and technology. Earlier this month, the Justice Department organized a brainstorming summit with mayors and police chiefs. FBI Director James Comey, testifying last week, said the recent "very disturbing" homicide spike has law enforcement scrambling to figure out why it's happening now, and why in so many cities that seemingly have little in common otherwise. "It's happening all over the country, and it's happening all in the last 10 months," Comey told the House Judiciary Committee. "And so a lot of us in law enforcement are talking and trying to understand what is happening in this country. What explains the map? What explains the calendar?" President Barack Obama will visit Chicago Tuesday to speak to a group of police chiefs from across the country at an annual conference. Obama will spend the night in Chicago and leave from O'Hare at 9:40 a.m. Wednesday. Just last week, Obama also participated in a panel discussion on criminal justice reform in Washington focusing on how to make law enforcement and correctional practices more just and effective. Violent crime has often been a local government concern and a problem that had been on the decline. But rising homicide totals in most of America's large cities have sounded alarms within the Obama administration, with federal officials drawing urgent attention to the problem before Congress, at conferences and in speeches. The police chiefs conference at McCormick Place began Saturday with remarks from Mayor Rahm Emanuel, who spoke about Chicago's strategy of community policing and the Chicago Police Department's efforts to curb violence by getting illegal guns off the street. The first day of the conference ended with the arrest of 66 demonstrators outside of McCormick Place who protested the police killings of Rekia Boyd and Michael Brown, among others. Many of them also chanted, "We got to stop the cops and fund black futures." On Monday, the demonstrations continued, but they focused instead on gun makers who were exhibiting at the conference. The group, comprised of leaders with United Power for Action and Metro Industrial Areas Foundation, called for "smart gun" technology that would require a gun to have fingerprint recognition in order to fire and help prevent the sale of guns to the wrong people.